Building our own copy of Mars in the laboratory was hard work. We had to shift 15 tonnes of sand to create a swimming-pool-sized model of the red planet. But the effort was well worth it as our experiments shed light on a much-debated issue: the origin of ancient water on the planet. The model suggests water erupted from large subsurface lakes creating enormous volcano-like eruptions. Back in the 19th century Giovanni Schiaparelli peered through his telescope and spied networks of channels on the planet. The similarity to the watercourses on Earth is striking. Ever since this discovery, scientists suspected that Mars could have had liquid water on its surface. 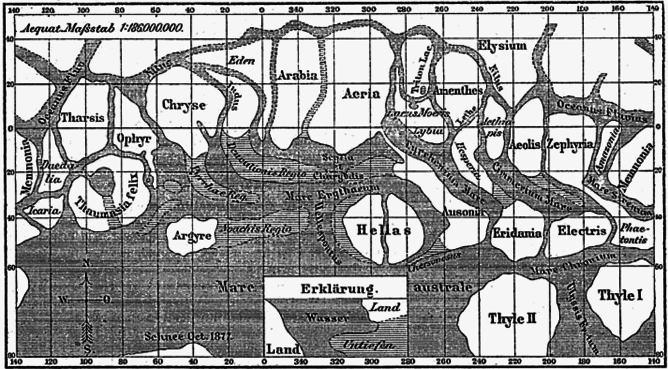 Historical map of Mars based on Giovanni Schiaparelli’s observations. Now, it is widely accepted that Mars did have surface water once upon a time. But all the contents of those channels have long since gone. Mars’ atmosphere is now very thin (about 1% of that on Earth), which means that any exposed water essentially boils off into space. 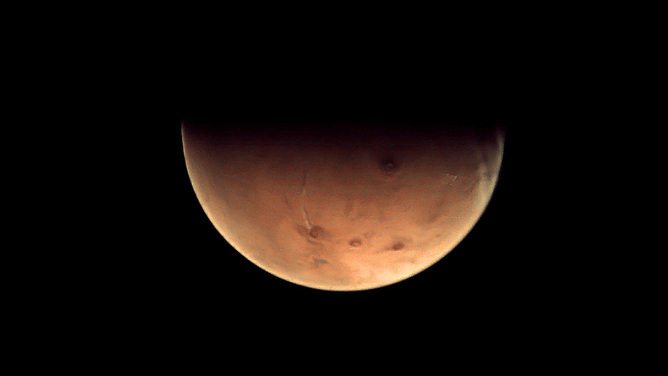 The tiny fraction that remains on modern Mars is locked away as either ice at the poles or within abundant water-rich materials, such as clay. So we can’t observe any ongoing water erosion on the red planet’s surface. I normally work on the formation of rivers and channels on our own planet. But the Martian versions are no less fascinating and it turns out that all the tools that I use to study Earth-bound rivers are pretty good for extraterrestrial ones as well. Groundwater eruption in an experiment (left) and the resulting landscape of such event on Mars (right). Unfortunately there are a couple of major problems with studying channels on Mars. First, and most obvious, I can’t go there yet (and I don’t think my wife would let me go even if I could). Second, there really isn’t much water on Mars any more. So to answer the question of how water channels on Mars formed, it was obvious what we had to do. We had to build Mars here. Or at least a model of it. It is tough being a scientist. So a team of international scientists and I grabbed our shovels and set about constructing a mock-up scaled version of the red planets surface. After shifting all the sand we had our model of Mars’ sediments housed in a chamber the size of a swimming pool all within our Total Environment Simulator. Pressurized Groundwater Eruption Experiment from Wouter Marra on Vimeo. We used the model to add water in a variety of ways. We let it rain on our model, we trickled and flooded water over our mock Martian surface and we forced water up from beneath. Then we compared the features on the Martian surface with those that we made in our simulator. The scaled experiments, that took us three months to complete, suggest that the most important water flows on ancient Mars came from massive outburst floods of pressurised groundwater. 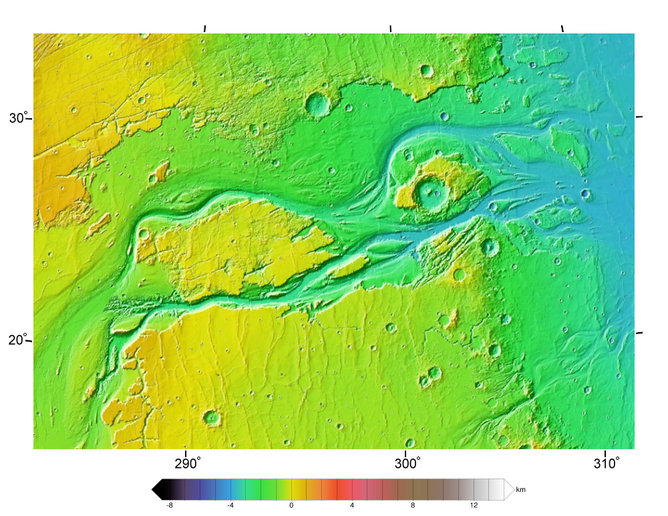 Topography map of Kasei Valles on Mars from NASA in Google Earth. We think the water may have erupted from large subsurface lakes creating vast volcano-like eruptions with maximum flood volumes that could be over 10,000 times bigger than the Amazon River on Earth. Our results suggest that this groundwater repeatedly flowed up to the surface, albeit very sporadically and in ever-decreasing volumes over time, carving out the channels that provide us with the evidence of these mega-floods from the past. It is quite possible that our experiments now explain the formation of these channels that caught the eye of Giovanni Schiaparelli as he peered through his 19th century telescope. Perhaps most importantly they suggest that water was not around for very long on the surface of Mars, which makes the hunt for extra-terrestrial life that bit more complicated. If water was not around in liquid form for very long then the chances that life existed on mars diminish significantly. Daniel Parsons is Prof. of Process Sedimentology and Associate Dean for Reserach (Science and Engineering) at University of Hull.